Roberto Valturio served as secretary and advisor to Sigismondo Malatesta, the notorious warlord who ruled the city-state of Rimini on Italy’s Adriatic coast. Written around 1460, Valturio’s book on military strategy was, in many ways, a wholly conventional project. 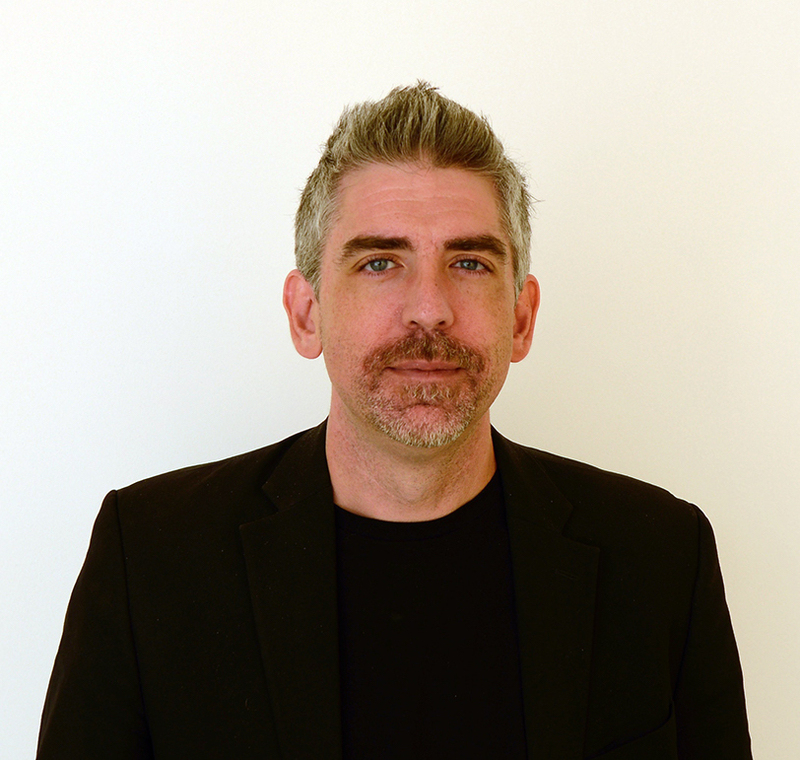 Indeed, while it promised privileged and tactically useful knowledge, the text represented little more than an adaptation of a late fourth-century work of the same name by Vegetius. Yet, if the humanist’s treatise offered few martial secrets, its translation into print a decade later in nearby Verona was a technological triumph. Accompanied by more than eighty woodcut illustrations, this book was among the most ambitious projects of printing’s early decades and represents one of the first illustrated editions produced by Italian artisans. Roberto Valturio, De Re Militari (Verona, 1472), quadriga or chariot drawn by four horses. New York, Metropolitan Museum of Art. 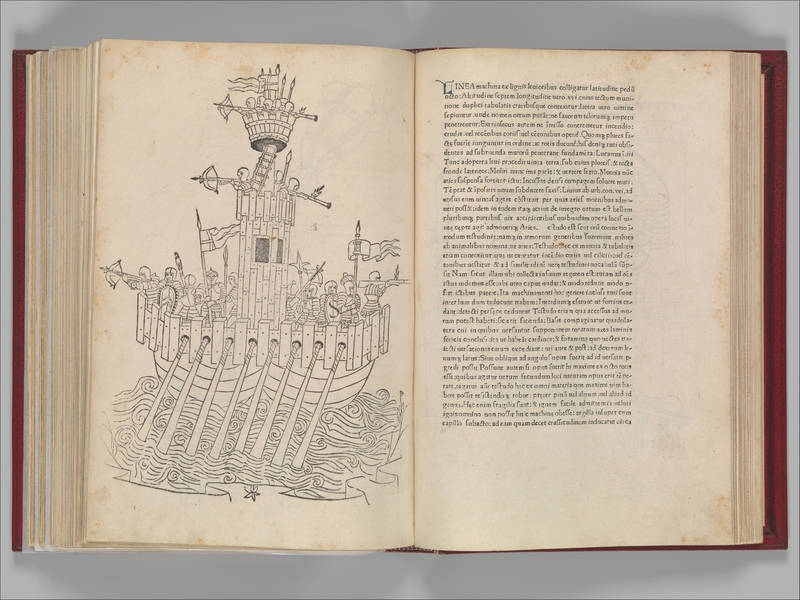 Roberto Valturio, De Re Militari (Verona, 1472), boat equipped with weapons and soldiers. New York, Metropolitan Museum of Art. The text touched on a wide range of matters ranging from the composition of Roman imperial legions to the qualities of effective commanders to the maintenance of discipline and morale. It was almost certainly not the author’s flowery and formulaic Latin, however, which made this edition a best-seller. 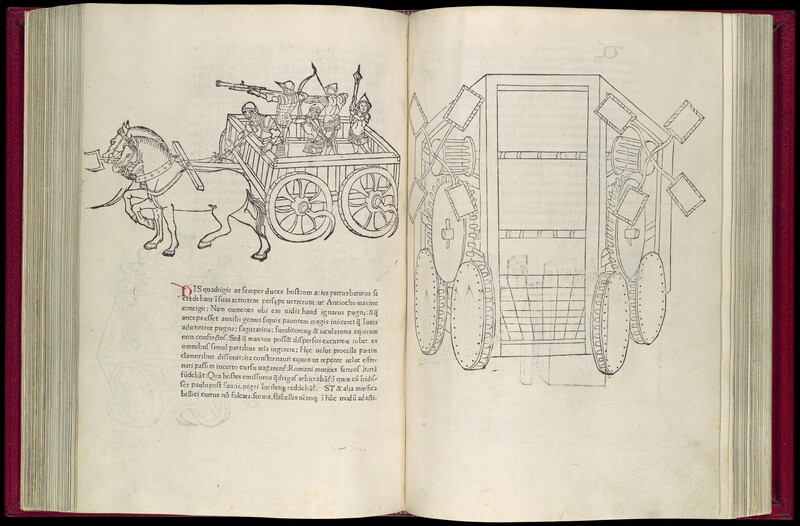 Rather, readers (or more accurately viewers) found themselves fascinated by woodcuts which brought siege machinery, fortifications, artillery, and all range of weapons to life on the page. Some of these images presented familiar and even practical devices like rams and crossbows. Others, however, including a fantastical floating fortress in the shape of a dragon – complete with a fire-spewing canon in the beast’s gaping maw – demonstrated the potential of print to spur the imagination of engineers, artists, and a reading public eager for such novel visualizations. 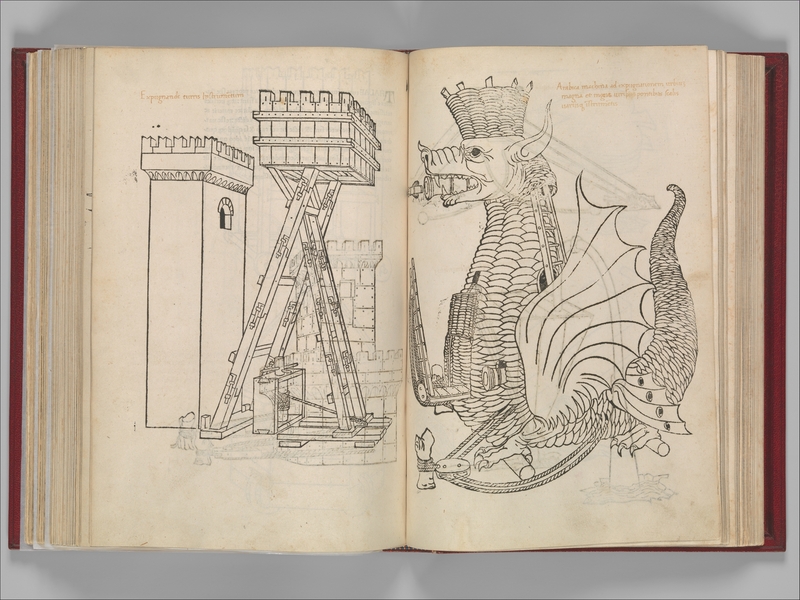 Roberto Valturio, De Re Militari (Verona, 1472), siege machinery and floating fortress in the shape of a dragon. New York, Metropolitan Museum of Art. Fully digitised copy from Bayerische Staatsbibliothek available here.